My little guy has had a cough for a few weeks now, nothing serious, but it’s there and it won’t go away. We have tried some natural cough syrups, expectorants, and the like, to no avail. I took him in to see his Pediatrician and the Doc said he has some seasonal allergies and prescribed him Zyrtec and also said he might have a little bronchitis type bacteria in his chest and wanted to give him a round of antibiotics. If you’re anything like me, antibiotics are the last thing I want to give my child if I have other options. They strip the gut of healthy bacteria needed for immunity, among other things, and you can become resistant to antibiotics over time and need stronger doses each time. This isn’t to say antibiotics are never to be used, but for something he barely had, I wanted to exercise my right to choose something else. In my holistic mind I knew that manuka honey could be used instead of the antibiotics and a natural allergy med could be used in replace of the Zyrtec, so I opted to pick up those two items instead of filling his prescription (gasp!). One day (maybe when our insurance covers it?) I will just take him to a Naturopath! When I got home I went to look into manuka honey a little more to ensure I was on the right track from what I’ve learned through school and sure enough, manuka honey is used for a host of things, one being bronchitis. Also, I went to look up Zyrtec and found a thread of moms complaining that it gave their kids negative behavior as a side effect. No, thanks. Manuka honey is raw, untreated, unpasteurized honey from New Zealand. Bees eat from the nectar of the manuka bush and its flowers. The manuka bush is a relative of the tea tree and the cool thing about the tea tree is its oil, it is a natural antiseptic, as well as antibacterial and anti-fungal. Through enzymes, all honey contains the ability to produce hydrogen peroxide (antibacterial), the deal is as soon as it hits light or heat, these properties are destroyed. Manuka honey has these same properties as well as non-hydrogen peroxide antibacterial activity that isn’t destroyed by light or heat. The main scientist who studied manuka honey, Dr. Peter Molan, called this the Unique Manuka Factor (UMF). Dr. Molan is a Senior Lecturer/Professor at the Biochemistry Department at Waikato University, New Zealand and has been studying the scientific factors of honey for over 20 years. At the time of discovering this Unique Manuka Factor in 1981, he didn’t know exactly what it was, only that this particular kind of raw honey had higher levels of antibacterial, antiviral properties than other honeys. In 2008 it was discovered by German Chemist, Thomas Henle, Head of the Institute of Food Chemistry at the Technical University in Dresden, Germany, the UMF is actually a substance called Methylglyoxal and is responsible for manuka honey’s antimicrobial content. I took an herbal first aid class from The Wellspring School of Healing Arts and in it, the owner of the school, Rylen, talked about manuka honey’s healing properties and its effects on wounds. She told stories of horse wounds in particular and how they heal faster when manuka honey is applied. It is a proven method for reducing wound healing time in humans and animals over conventional medicine. “A simple application of honey to horses’ leg wounds results in smaller wound sizes and faster healing time, University of Sydney researchers have found.” While this is not really a surprise, since similar research and trials with wounds on people has shown the healing benefits of using medical grade manuka honey, this is the first time a clinical trial has been done on horses. Cool, horse wound story from the Veterinary Practice news here. Not only is it incredible for healing wounds and cuts, but because it is antibacterial, antiviral, anti-fungal and anti-inflammatory, it can be used on a host of external and internal ailments. Take 1 tsp. on an empty stomach or in-between meals every few hrs. for internal use. For a sore throat, you can take 1 tsp. at a time throughout the day or dissolve a tsp. or more in boiling water and/or add it to a tea and take it that way. Because the Methlyglyoxal won’t break down with heat or light, the antimicrobial properties are left intact. It’s best to take on an empty stomach to maximize the benefits in your gut, but you can always spread it on toast, too! What Kind of Manuka Honey Should I Buy? *Update: Apparently the above are crap brands. Well, maybe not that, but they are not UMF certified meaning you might not be getting the active ingredient in its full strength and you’ll be paying a pretty penny for it. The list of UMF certified brands can be found here. The Trader Joe’s Manuka is supplied by Cambridge Bee Products, which is on the licensing list and more affordable than some of the other brands. Thank you, Gia Health Blog. I hope you look into manuka honey for your own family and add it to your medicine cabinet. It’s some great stuff! This post is also linked to Sunday School at Butter Believer! Previous articleSlugs In Your Garden? Wow, that is cool stuff! 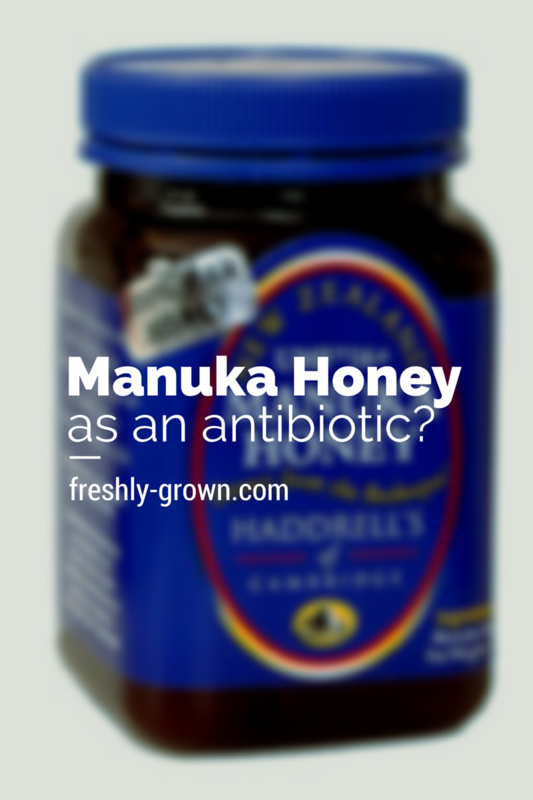 I wonder though…do you have to worry about using Manuka too much? Is there a danger of developing a resistance to it like you have with regular antibiotics? Angela, no not at all. In fact, it does the opposite! If you are resistant to antibiotics manuka honey can help reverse this. How cool is that? This stuff blows my mind and I’m not one to jump on the bandwagon of 1 thing cures all, but it sure treats a lot of ailments. A friend’s son had hand, mouth and foot with a rash all over and he started healing immediately when it was applied with coconut oil topically and then taken orally. Love it. You cannot become resistant to antibiotics. ?? Please do more research on antibiotic resistance. Hi: I normally dont comment on posts, but I should. ..Im not sure what brand you purchased, but hopefully it wasnt Wedderspoon. Official Manuka honey requires a UMF or MGO rating to be considered the right levels. Wedderspoon I know for a fact does not adhere to either of the official ratings and claim to use their “own rating system”. Also if it doesnt say its packaged in New Zealand (import sticker as well)…then its just shipped and processed (takes weeks to bring it in) in America… Here a few articles below for more info…. I recommend any brand that is at least registered… I know this because I was using Wedderspoon as well and the price doesnt justify the smokescreen they put up. This was great information on Manuka Honey, Thank you for sharing. produces sebum – oil. Antibacterial; fights infections; provides acne relief. My son who is 14 months has just started daycare and is down with a viral infection. As I have looking for natural remedies for future prevention – I want to check what is your recommendation for administering the Manuka Honey (12+ – Which i am planning to start my LO with ) ? As long as your child doesn’t have an adverse reaction to honey in general, I would start with 1/4th 2x/dy. while she has the viral infection and see how your child responds. You could increase the dosage if you feel it necessary. As far as prevention 1/4th tsp. per day is a good place to start. it is very useful for us ,thanks a lot and God bless u.pls send me healthy tips . Don’t feel bad about those “crap” brands as you worded it. Like you said “crap”is an “iffy” word, because they are probably wild raw honey, but they are charging top dollar like they are a UMF honey, and many are testing out with no active MG at all, so technically it’s “crap”. But, until you look deep into it, everyone gets burned on it. Glad my article could help. Agreed! Not crap, per se, just misleading if folks are wanting the active, medicinal UMF ingredient. Thanks for your post, very informative. I had severe leg ulcers and was treated at a wound center recommended by the local hospital and the doctors and nurses at the wound center treated my legs with manuka honey and they were amazed the how fast I heated. Hi thank you so much for sharing this helpful information I have a question is it safe to give my 5 year old manuka on a daily basis to boost her immune system? It’s just like regular honey so I’d say yes in moderation because it is still sugar. Great article! Do you vaccinate your child? I’ve read a lot of mixed info in the holistic world. Thanks for this article! My daughter has had a post nasal drip caused cough for about a month now. I’ve been using essential oils but they haven’t helped. Took her to the doctor this week and she prescribed claritin for allergies but it hasn’t seemed to help. My dog had bone cancer and ended up with a raging infection at his amputation site. We tried every antibiotic in ridiculously high doses to no avail. My vet recommended we try manuka honey and it cleared up in 2 weeks and the wound healed without replacing the stitches. As a mom now I was wondering if it would help with my daughters sniffles and cough. Thanks for the info – highly recommend it for topical use too. I’ve been using Manuka Honey for years on scrapes and burns and my mom would get bad cold sores and immune system was compromised going thru dialysis and CHF, and if she felt one coming on I would have her apply it and it wouldn’t even begin to form..then if it was big and broke down the skin, I would have her put it on each time it dried add more. Three days tops depending how bad it was. Unfortunately I was a victim of a crime two years ago and it left me HIV positive at 46. Today, I am drinking Manuka honey with tea. 5 days ago, I got the nagging feeling of a sore throat. Mind you I haven’t had a cold in a decade, and then within two days I felt like death and fear contributed to that, I am undetectable but this is my first bout of illness after my diagnoses… I was sick. Not eating and high fever… slept for two days straight. Then twice a day I started Manuka and tea starting Sunday night. My chest cold and sore throat all but disappeared. Manuka is a miracle.